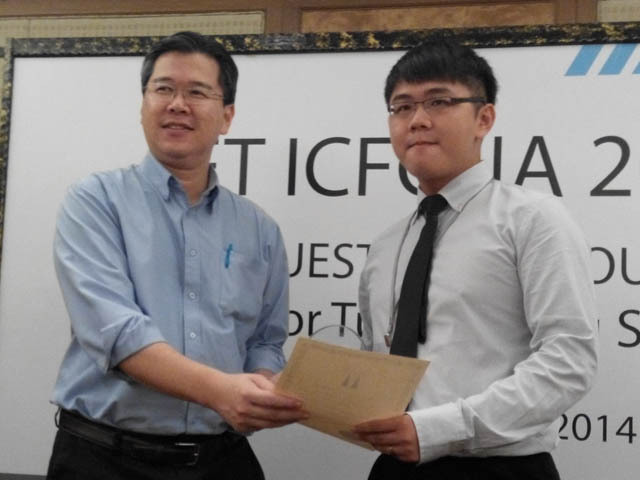 A team of researchers from UTAR Faculty of Information and Communication Technology (FICT) won the Best Paper Award in the Institution of Engineering and Technology (IET) International Conference on Frontiers of Communications, Networks and Applications (ICFCNA) held at Sunway Resort Hotel in Kuala Lumpur from 3 to 5 November 2014. The team comprised Master of Computer Science student Sia Yeong Kang, FICT Dean Dr Liew Soung Yue, Department of Computer and Communication Technology Head Dr Goh Hock Guan and Dr Gan Ming Lee. 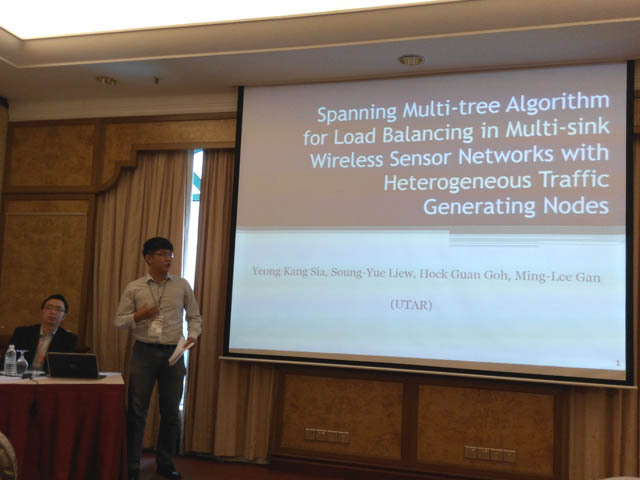 Their paper, titled ‘Spanning Multi-Free Algorithms for Load Balancing in Multi-sink Wireless Sensor Networks with Heterogeneous Traffic Generating Nodes’, won the Best Paper Award in the Smart City Track category. Smart City aims to improve the quality of living in urban areas through smart sensors, devices and services deployed in a distributed manner to monitor and adapt to the environment in real time. The paper was part of Sia’s Master’s studies and inspired by the rice field monitoring project that the team is currently working on. “In wireless sensor networks (WSNs), sensor nodes are expected to work in remote geographic areas unattended by humans. During sensor nodes deployment, we found that each node may possess different traffic generating rates due to the requirement of application and position of the nodes. Therefore, a load balancing technique is required for handling nodes with heterogeneous traffic generating rate,” explained Sia. Load balancing is one of the techniques to prolong the network lifetime of WSNs. He added, “We wish to develop a reliable and efficient load balancing algorithm for WSNs that is able to prolong the lifetime of WSNs as well as to be compatible with all kinds of applications. We consider using multi-sink WSNs to balance the traffic among sink-adjacent nodes rather than just focusing on the sink nodes. In this paper, we proposed three heuristic Spanning Multi-Tree with Load Balancing algorithms, namely, Largest-Traffic-First, Smallest-Extendibility-First and Smallest-Extendibility-First-Smallest-Potentiality-Second.” Theoretical analysis and simulation results show that the proposed algorithms are able to achieve constant load balancing over various node transmission rates and density. Sia also expressed his appreciation to Dr Liew, Dr Goh and Dr Gan for their invaluable guidance and assistance. Dr Liew and Dr Goh, both his supervisors, helped to develop the algorithms, protocol and system modelling while Dr Gan worked on paper writing. “As for myself, I worked on the technical sections including programming, result compilation and analysis. It was good teamwork that brought us success,” said Sia. He also thanked FICT for their active bidding for new research funding, which enabled his paper to receive sponsorship from the Ministry of Science, Technology and Innovation through the eScienceFund. Organised by IET, the ICFCNA which was co-organised by UTAR aimed to gather academic, researchers and industry practitioners from around the world to meet and exchange ideas on recent developments, current research work, challenges and future directions of all aspects of communications, networks, as well as ICT systems and applications.